Got 10 minutes to spare? Here’s a side dish to awe your taste buds. The latest Fine Cooking magazine has a full article about tomatoes, perfectly timed when farmers markets are overflowing with those in all shapes and sizes. Normally I don’t buy beefsteaks, favoring smaller types like Campari, grape, and cherry. But this recipe called my name loudly. 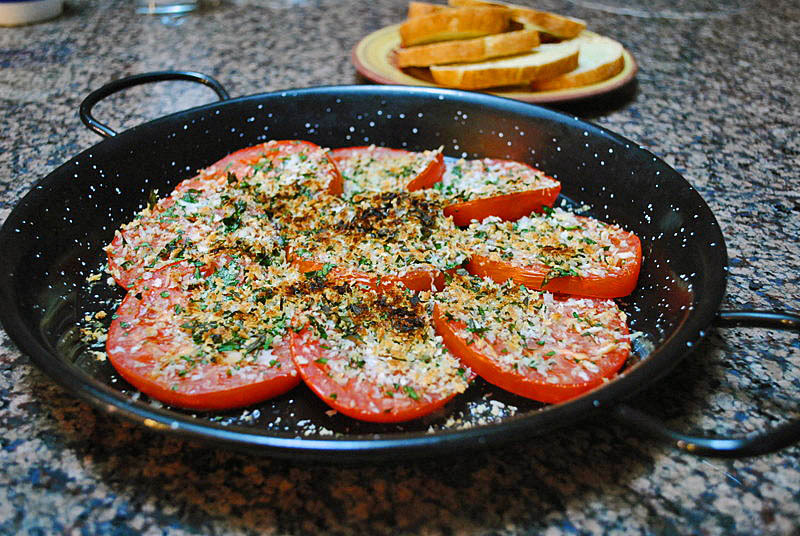 Cut the tomatoes in 1/4 inch thick slices, and place them with a little overlap on a broiler-safe type of dish. Mix the bread crumbs with the cheese and the herbs and sprinkle all over the tomatoes. Season them with salt and pepper (Asiago cheese is salty, use less salt than you normally would); drizzle a small amount of olive oil over the tomatoes (use a spray bottle if you prefer), place the dish under the broiler for 3 minutes or until it starts to get golden on top. Serve right away. Comments: This recipe may very well change my mind about keeping beefsteak tomatoes around the house. They stand up to the broiler nicely, and the salty/cheese crust on top is a nice complement to the juiciness of the tomatoes underneath. Phil said that he could imagine this dish on the menu of an American steakhouse, next to a substantial T-bone steak, grilled medium rare. 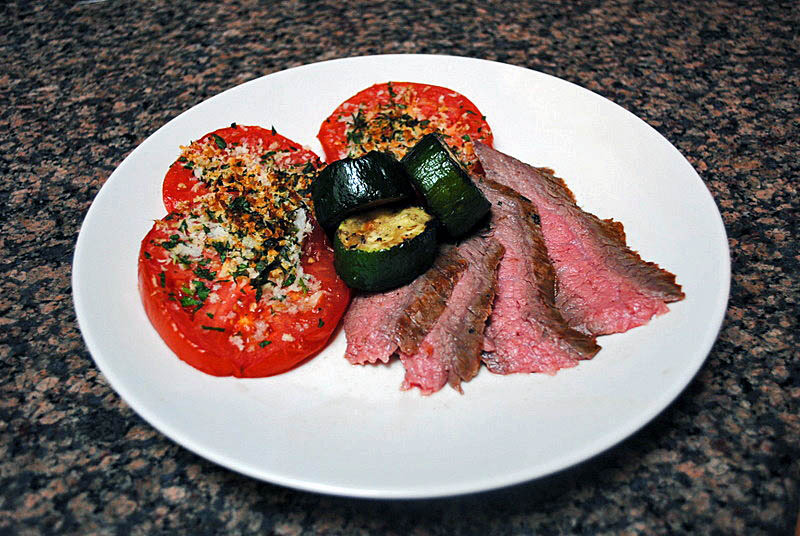 We took a more humble route, and served them with flank steak, and grilled zucchini slices. Summer dining: simple, light, and quick to put together. Sally, this looks great – so many mouth-watering flavours going on here and let’s face it, anything that contains ‘herbes de provence’ is bound to be delicious! I love that it is so easy and achievable. indeed… herbes de provence makes anything special! Oh that looks fabulous. And if you don’t like beefsteaks, it’d translate well to about any other type of tomato. Campari could be great with this treatment… must try! When I spot beefsteak tomatoes that actually smell like a tomato! I do use them. This is a really simple, great looking side dish. Normally I’ve roasted the entire tomato, but love the idea of roasting in slices with the topping. Simple is always good when you have a great tasting tomato. I can’t wait for my heirlooms to start ripening. That little bit of crunch on top from the herbs and cheese will be great. I understand why this caught your attention – it sounds fantastic! Sounded great, and great it was! Looks fresh and delicious! I know I’ll be popular in my house if I served this up with some T-bone! I made this for a book club and they loved it. Most of my book club are not meat eaters, so I made a lot of it. Nice idea for a book club, Carole – light and tasty! oooh wow that looks really great, it seems that my tummy is grumbling now lol.. I will be getting them again – a sturdy tomato is not something to disregard 😉 The possibilities are endless! That was such a great article in Fine Cooking, and these tomatoes look amazing.